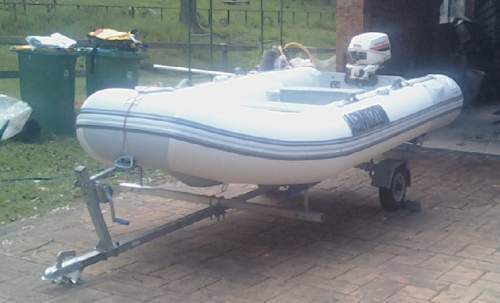 This Used None ZODIAC INFLATABLE INFLATABLES boat for sale 3.6 mt long ,has an inflatable floor.Accessories include an extra seat, 2 underseat bags, boat cover, 2 life jackets, oars, marine carpet, 12 volt air pump. A Oceanic Ezyfold Galvanised Trailer.Both boat and trailer are as new, in immacculate condition, used for 3 hours only while on holidays in Qld, July 2011. Both have 7 months NSW registration to 12.07.13. The motor is NOT included. Replacement cost for boat, accessories and trailer is $4900. Sell for $3500. Will separate, boat for $2600 and trailer for $1000. Have no further use for these now. Located on the Central Coast of NSW.